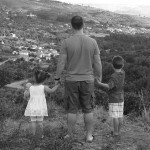 You are here: Home / Blogs / Google Does Everything Right! Google – Can they do anything wrong? I asked this question on October 22, 2004 on my former blog, Market Talk with Piranha, which you can still enjoy online. That was my “blogger” blog while running MSW and before starting chrisperruna.com on wordpress. It is now three years since that post and I have not owned GOOG for the entire run, not even close to the full up-trend. So, why didn’t I own it the entire time? I ask myself today what I asked myself then: WHY NOT? I guess my answer boils down to trying to beat the market with swing trades in speculative stocks. I’ve come to realize that it is more profitable to just stick with a winner over the long term and trade them like a turtle (per the book by Curtis Faith). I need to better weather the draw-downs with trending stocks and ignore the shorter term daily fluctuations. If I could successfully do that, I would have owned both GOOG and AAPL for their entire runs instead of pieces of their profits! SCRAPS when looking back! Google (GOOG) is now up more than 350% during the three years and crossed $600 per share in intraday trading today. 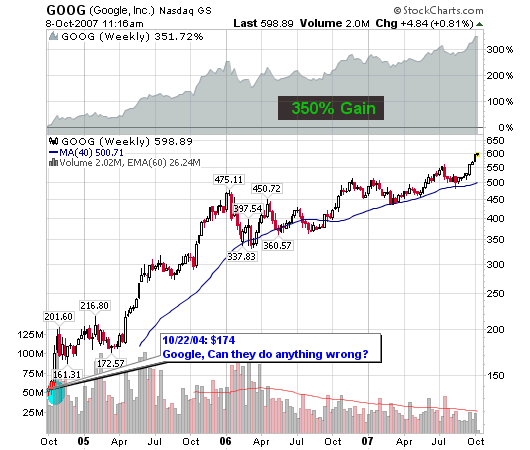 Is it hard to believe that GOOG may reach $1,000 per share before this great run is over? Hell no! Great stocks with increasing earnings go higher. They continue to make higher highs so never be afraid to buy stocks making new highs during bull markets or stocks that have a P/E ratio above the rest of the field. Luxury items demand a premium price! Google reported Thursday and missed expectations by $0.11: Earnings were at $0.45 per share, up 25% vs. a year ago. Revenues rose by 105% beating views. Shares were up about 8% in after hours trading. We can now see how the after hours trading would pan out today. A huge gap up on extremely large volume has sent Google up 16% today. Too bad Google can’t help the rest of the market as it is “dead as a doornail”. The Google gap up started the day at $170.43 The stock closed the day yesterday at $149.38 Currently at noon, it is holding around $174 (up 16% for the day). What a run since the IPO. Anyone could have gotten in at $98 to $100, too bad I wasn’t one of them! I have seen GOOG come up on my preliminary screens but I was holding off until they reported earnings and formed a pattern I was comfortable with. Back to Google, I love the site, I love the company and I love what I see in the stock, so why don’t I own a piece of it? Listen to me Google, set up a solid base and allow me to ride the next wave! I did ride that wave but I jumped off too soon! I originally bought Google in October 2005 and watched it race up about almost 40% in two and a half months to the start of January. I figured “It’s Google! It’s going up forever!” Well, I was wrong and watched my profit go down to zero in four weeks and with my spirits deflated I ended up selling for a slight loss (bought at 339, sold at 335). Well, a year later, I had learned some lessons. I bought last October at 426. I watched Google gap up and move sideways, move up and gap down and move sideways, and now watching it move up. So, the lessons I have learned with this stock is that even though it looks like a very powerful stock (and it is), it has long periods of sideways action. I got really bored holding it this year and considered selling it because for 8 months I had no gain in it. Luckily, I decided to hold on because I believe in the business. I also own BIDU (which has performed way better), but I think Google is a more stable investment. BIDU is going to tank sooner or later, and even though Google will eventually start to crumble, I think it won’t happen as quickly. I bailed out of both GOOG and BIDU too early. Excellent profits but not nearly as large as they could have been. I don’t feel bad about the GOOG sell because my money went to work elsewhere but my BIDU sell over the summer stings slightly. I missed a big portion of the recent move to $300 . And this money did not make more elsewhere! Hey, we can’t argue gains. I will continue to learn and hang in with these great bull runs. One thing that has changed in my trading is I have a bit more emphasis on hanging with a stock rather than trading off the technicals, which is where I started. I read “Practical Speculation” by Victor Niederhoffer last summer and decided that my trading style needed refinement. I find that when I trade less often, my results are better.